Brown mite: The adult female is a dull reddish brown with dark orange markings, and somewhat flattened. The front legs are very long, over twice the length of the other legs, and extend forward from the body. 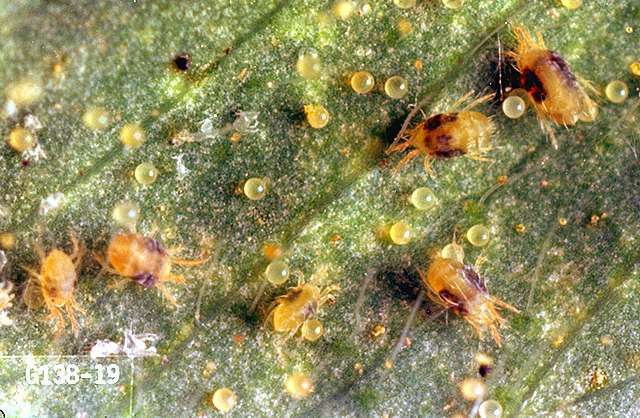 European red mite: Adults are globular, reddish with white spines. Immatures are similar in appearance, only smaller. Eggs red and globular. 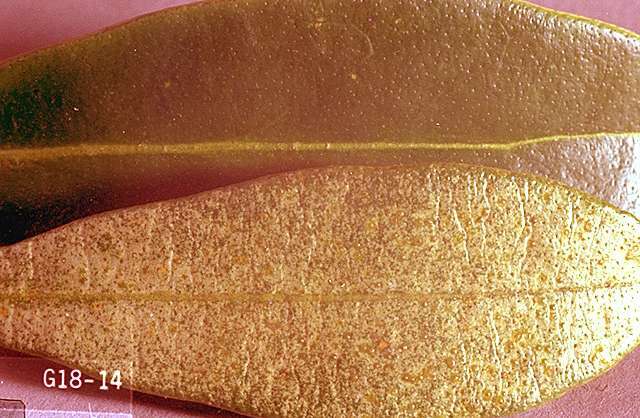 Two-spotted or McDaniel mite: Adults are yellowish-brown, about 0.02 inch long. Twospotted mites have two dark spots on the body, while McDaniel mites have four. Immatures are similar in appearance, only smaller. Eggs are round and translucent to opaque. Yellow spider mite: Adult females are pale yellow to white with 2 or 3 dark, rectangular markings on each side of the abdomen. Immatures are similar in appearance to the twospotted spider mite, but have more of a yellowish color. Eggs are clear and spherical. Spider mites damage leaves by puncturing cells and sucking out the contents. This produces small yellow-white spots on the upper leaf surface. In heavy infestations, the spots coalesce and the leaf yellows or bronzes. Biology and life history Two-spotted, McDaniel and yellow spider mites overwinter as fertilized females under bark or in soil debris. 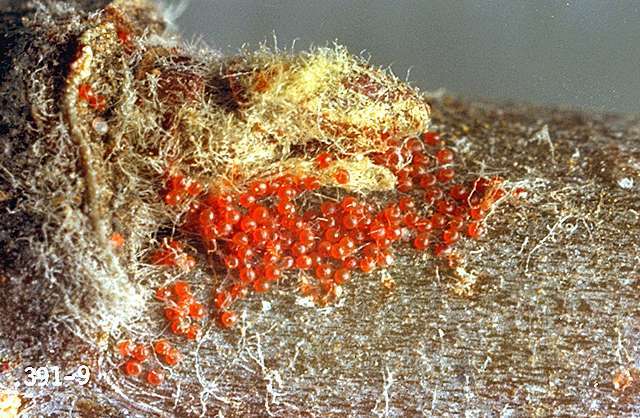 European red mite and brown mites overwinter as eggs in crevices of twig bark and young limbs. They move to young foliage when buds break in spring and produce many generations during spring to autumn. Females can lay up to 10 eggs per day and more than 200 during their lifetime. Egg-to-adult development can occur in 7 to 10 days during summer. They thrive under hot, dry conditions. Large colonies of mites produce webbing. Dispersal occurs mainly through wind transport. Scouting and thresholds Thresholds have not been established, but economic damage is unlikely at levels below 15 to 20 per leaf. Treatment thresholds always must consider the presence of predatory mites, which are major biological control agents (see below). Spider mite populations are held down by cool, wet conditions early in the season. Considerable natural control is provided by lady beetles (Stethorus spp.) and minute pirate bugs (Orius spp.). Predator mites such as Typhlodromus spp. or Neoseiulus fallacis (syn. Amblyseius fallacis) are also effective at managing populations of spider mites and may be purchased. Avoid broad-spectrum insecticide sprays to protect predators. insecticidal soap-Avoid spraying when blossoms are open. May require several applications. Some formulations are OMRI-listed for organic use. horticultural mineral oil at 6 to 8 gal/a in up to 400 gal water. REI varies by formulation; see label. Some formulations are OMRI-listed for organic use. lime sulfur (calcium polysulfide) -Formulations vary; see label for rates . May be mixed with horticultural mineral oil at 6 to 8 gal/a in up to 400 gal water. REI 2 days. Some formulations are OMRI-listed for organic use. 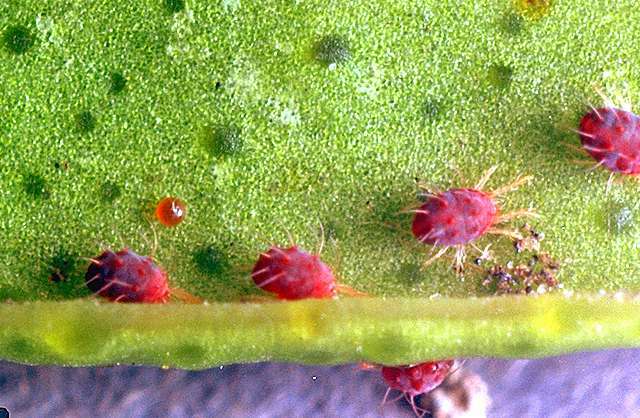 Choice of miticide varies with species of mite present, selectivity to predatory mites, and other factors, such as resistance present in an area. bifenazate (Acramite 50WS) at 0.75 to 1 lb of product/a in up to 100 gal water per application. Do not exceed one application per season. Do not use with oil on Golden Delicious due to risk of phytotoxicity. REI 12 hr. PHI 7 days. Resistance management Spider mites develop resistance rapidly to chemical controls. Alternate chemistries and modes of action.